First of all, donate! We need to raise money to assist LGBTQ people to get out of Uganda. See our latest appeal here. And tell others! We need to spread the word to because the more help we get the more we can do. Like our Facebook page and share our posts. Follow us on Twitter and share our tweets. Subscribe to the FUST eNews and share our posts. The way to become a sponsoring Meeting, church or organization is to write and share a Minute or a letter of support and let us know! And share it as publicly as you can. We hope you will also make a donation and encourage your members and attenders to also do so. Print and share our flyers! We have a full page 8.5″x11″ flyer and our 4-up small flyer both in PDF format in color – but they can be printed in grayscale as well. Help us spread the word! Throw a fundraiser or table for us at an event! Contact us to plan this. Invite us to speak to your Meeting, organization or at an event. We are based in Olympia, Washington. 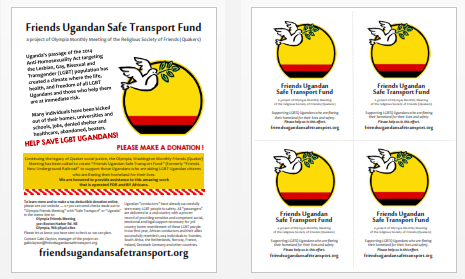 If we can’t come in person (because all the funds we raise go to the work in Uganda) we may be able to speak to your Meeting or group by Skype. Contact us.